It was a ceremony steeped in pomp, pageantry and centuries of British tradition, but Queen Elizabeth's coronation 60 years ago today also marked a revolution in the power of television and some Canadian firsts, including the first time a "Queen of Canada" was crowned. It was a ceremony steeped in pomp, pageantry, glittery golden jewels and centuries of British tradition. But Queen Elizabeth's coronation 60 years ago today also marked some notable Canadian firsts. Never before had a "Queen of Canada" been crowned, and never before had Canadians seen same-day coverage of such a high-profile international event unfold on that relatively new arrival in their living rooms — TV — a phenomenon that seems quaint in today's instant Twitterverse. Toronto-based royal historian Carolyn Harris says one of the defining moments of the three-hour ceremony at Westminster Abbey that rainy June day in 1953 lies within the coronation oath. "The Queen is the first monarch to be crowned Queen of Canada," says Harris. While the Queen's Diamond Jubilee was marked by elaborate celebrations last year, the 60th anniversary of her coronation isn't garnering quite the same level of attention. That's hardly to say it's being ignored — the Queen and the Duke of Edinburgh will attend a service at Westminster Abbey on Tuesday and a three-day coronation festival will be held at Buckingham Palace in July, (which might be at least temporarily overshadowed by the arrival of her next great-grandchild, if tabloid rumours of the Duchess of Cambridge's due date of July 13 are correct). "She gave her coronation oath as Queen of the United Kingdom and Northern Ireland, Canada, Australia, New Zealand, the Union of South Africa, Ceylon, Pakistan and her other territories. "And this is very different from previous coronation oaths that had not individually stated the names of these various realms and dominions." After the introduction of the Commonwealth in 1949, Elizabeth's father, George VI, became its first head, a role that he took seriously until his death in 1952. With the addition to the coronation oath of the Commonwealth countries, the new Queen was "carrying on her father's work regarding the newly created Commonwealth," Harris says. Elizabeth's devotion to the Commonwealth has been deep, extending far beyond the symbols of its countries — including a Canadian maple leaf — that she had embroidered on her elaborate white satin Norman Hartnell coronation gown. When she announced recently that she will be sending Prince Charles in her stead to a Commonwealth heads of government meeting later this year, it sparked much speculation surrounding the degree to which she may be stepping back from some of her more central royal duties as time and age make their mark. Aside from the Commonwealth addition to the oath, however, other elements of the 1953 ceremony were much more rooted in the past. "The structure of the coronation, where it takes place, the anointing and the crowning and the swearing of fealty, all these traditions are more than a thousand years old," says Harris, noting the first Westminster Abbey coronation was that of Harold II on Jan. 6, 1066 – a slightly inauspicious moment as the Normans invaded and took the crown later that year. The solid gold crown that was placed on Elizabeth's head during the ceremony weighs more than two kilograms, and was first worn by King Charles II in 1661. She left the abbey wearing the more famous Imperial State Crown, which had been remade with more than 3,000 gems transferred from the old Imperial Crown that dated to the 17th century. The golden orb, which glitters with emeralds, rubies, diamonds and pearls, was also made in 1661. The coronation ring is slightly more modern, having been made in 1831 for William IV. Brand new in 1953, however, was the medium of television. But it wasn't an instant or easy decision to let cameras inside the ancient abbey walls. "The Queen was at first against the idea, fearing the eyes of the world on her every facial movement and on possible mistakes," author William Shawcross wrote earlier this week in the Daily Telegraph. "These were sacred rituals, surely not to be flashed live around the country and thence at once around the world." British prime minister Winston Churchill had also opposed the idea, thinking the TV cameras might place an undue strain on the young monarch. Eventually, though, the Queen changed her mind, after entreaties from the BBC and clear interest from the public, Shawcross wrote. "The Queen gave way, insisting only that there should be no close-ups of her face at the most sacred moments of all — when she was anointed and took communion. She wanted her moments with God to remain unseen by the world." The arrival of the TV cameras was revolutionary in more ways than one. With the ceremony being broadcast, Harris says, "people could host their own coronation parties and see the ceremony very soon after it happened." While Queen Elizabeth's 1953 coronation has become an iconic representation of royal pageantry, other efforts to put British sovereigns on their thrones have not been so smooth. Crown jewels lost in bogs, a coronation ring that wouldn't fit and a disgruntled, estranged queen consort banging at the doors of Westminster Abbey to get into her husband's ceremony have made for unpredictable or unseemly spectacles. Click here to read more. 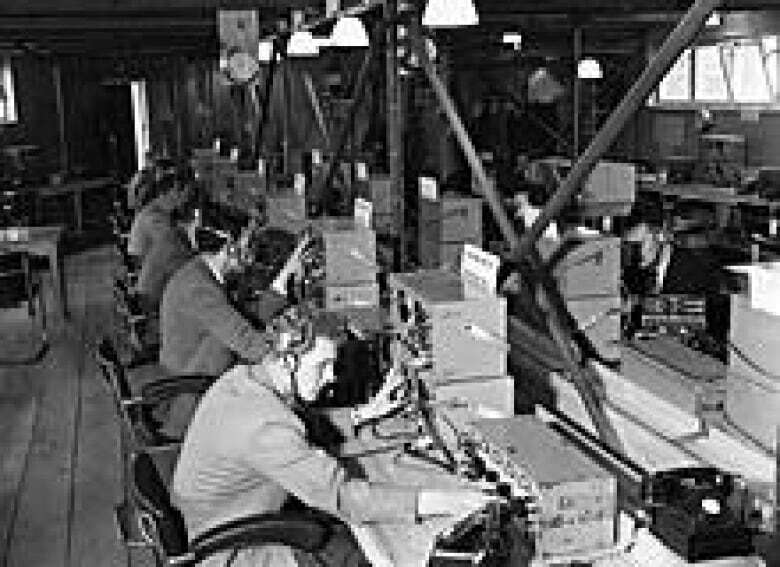 That appearance on Canadian TV screens came as the result of a highly orchestrated CBC plan under the name Operation Pony Express. It involved Royal Air Force Canberra light bombers and Canadian CF-100 fighter jets flying coronation films from London to Goose Bay, N.L., to Montreal in a relay. "The television coverage of the coronation seems to herald an exciting age," reported the CBC Times broadcast guide for May 31-June 6, 1953. "Never before has the crowning of a British monarch been televised. Never before has a TV program been seen in England and North America on the same day. 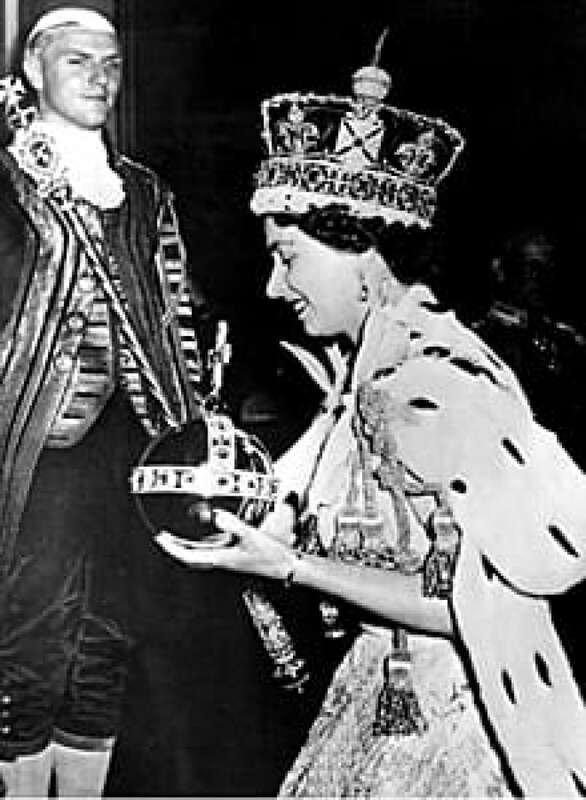 The worldwide television audience for the coronation was thought to be 277 million, which was considered an extraordinary number for that time. "Television was very new technology and television sales spiked during the lead-up to the coronation," Harris says. "They continued to rise afterwards as people who had watched the coronation on their neighbours' television sets decided to buy their own, so it created a tremendous boost for this new technology." The coronation ceremony also reflected what Shawcross saw as "the paradox — indeed, the genius of constitutional monarchy." "This system of government may seem archaic to those who consider themselves progressive," Shawcross noted, "but it has worked remarkably well for centuries. "Never better, perhaps, than under this monarch. And that is at least in part because she is utterly true to everything she experienced at her coronation." Not everyone was enamoured of the event, mind you. Ninian Mellamphy, a longtime royal watcher and retired professor emeritus from Western University in London, Ont., was a high school lad in Ireland in 1953. His family didn't have a TV and he had no interest in rushing off to England to see the celebration, although he knew people who did. "There was kind of a strange way in which people like me who were, let's say, anti-imperialist, were enjoying the shattering of empire," he says. "In a very narrow-minded way we thought this is a moment of English privilege and something in a sense that didn't directly affect us." Now, however, he looks back with respect at how the Queen has reigned. "She must have a great deal of satisfaction in the way she has lived and lived through difficult times and lived with great dignity." For some, the coronation event itself became the ultimate representation of royal celebration, magnified in large part because of the TV coverage. "This particular coronation has become iconic in not only how the Queen is viewed, but how royal ceremony is viewed," says Harris. For example, when Queen Beatrix of the Netherlands abdicated earlier this year, and her son Willem-Alexander became king, some commentators called it a coronation, even though a crown was never placed on his head. Harris attributes that to the way the Queen's 1953 ceremony has permeated the popular imagination. "The iconic status of the Queen's coronation has contributed to that view … that that is what royal ceremony looks like even though the different monarchies of Europe and around the world have very different approaches to celebrating the ascension of a new monarch."